Make #TahoeTuesdays your new favorite day of the week! 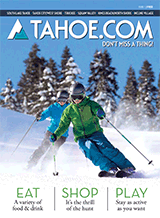 Show your local love all year round by purchasing a GO Local Loyalty card and visiting participating businesses on #TahoeTuesdays to enjoy deals and discounts. The various promotions being offered include discounts and free products from restaurants, retailers, and recreation businesses. For Tahoe locals and long time visitors alike, the South Shore of Lake Tahoe is a very special place. Choosing to buy local preserves community character and one-of-a-kind businesses, as well as creating jobs and growing the local economy. Take the pledge to shop local all year by rocking your Go Local Loyalty card!